Now that it’s officially fall, I find myself drawn to warming, robust, hearty foods. I believe in intuitive eating; if the motivation is pure (not chemical or addiction related), I believe that following the lead of our bodies can guide us to health. In the fall, transitioning to nourishing, warming foods and beverages prepares our bodies and it’s systems for the cold of the winter. Energy levels and metabolism slow in winter, but it doesn’t have to translate to a sluggish season, if we eat with intention and keep warmth and nourishment in mind. In honor of this idea I’m beginning the “Skillet Saturdays” series. Each Saturday I’ll be posting a quick recipe for a tasty skillet. 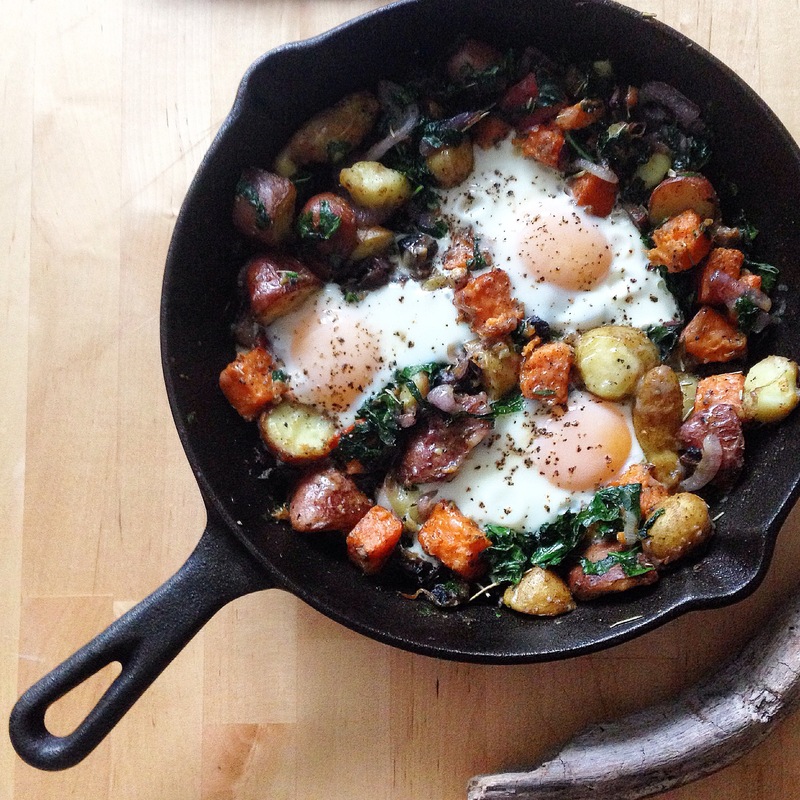 Skillets are great because you can do everything all in one pan. I very much dislike doing dishes so these one dish wonders make me very happy. Skillets do require a pan that is both stove-top and oven safe. I use a quality, old-school, cast iron frying pan and I love it. Cut potatoes into bite-size pieces (I always keep the peel on both), put in a pot of cold, salted water and bring to boil. Boil rapidly for about 10 minutes. After 10 minutes add bite-sized pieces of yam to the potatoes. Turn oven on to 375F. Saute over medium-low heat, sliced mushrooms and onions in a large dollop of coconut oil in the skillet frying pan until soft. Add a bit of salt and pepper. After the potatoes have been boiling for about 20 minutes (yams were in for 10 minutes) drain and add them to the skillet. Add rosemary and a bit of salt and pepper (yes again). Stir and saute for a minute or two. Add in more oil if the pan is getting dry. Add in chopped kale and stir gently but constantly for about a minute. Spoon aside little spaces for the amount of eggs that you are making – they should be directly on the pan. Add more oil or butter if the pan is dry. Crack an egg into each space, sprinkle with a bit of salt and pepper (yes again) and gently place into the oven. Keep in the oven until the white of the egg is cooked but the yolk is still runny, about 5 – 10 minutes, but it is important to watch it so it doesn’t dry out. Previous Post 5 Awesome: Berries!